Most parents hate video games, it's no surprise really, EA's even gone and made a whole marketing campaign for Dead Space 2 based on that very conception. Still, occasionally lucky ones are born to some parents who have a passion and appreciation for video games, like this kid. 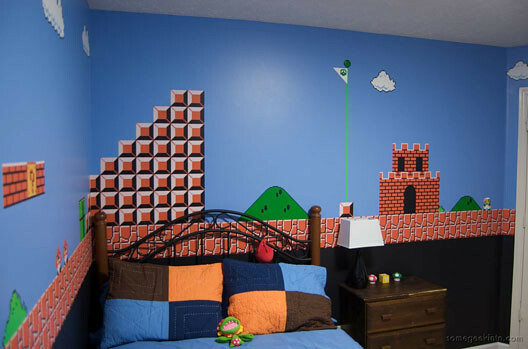 The parent in question, Casey Fleser, decided at random to paint and decorate his son's room with a level from Nintendo's Super Mario Bros. In fact, his goal was to recreate World 1-1 of the classic platformer. "I didn't really think about it, except that it would be cool," said Fleser. "I really wanted to map World 1-1 of the original game onto the walls." That aside, Fleser pointed out that it would've cost a bomb, a big $1100 bomb, to use ThinkGeek decals to recreate the level. Fortunately, thanks to his mad DIY skills, Fleser managed to create his own decals and even paint freehand on several portions of the room.